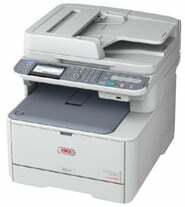 The Oki ES5430 is a colour laser printer designed for use in a busy office or workgroup. The compact footprint means it is easy to place in a small office and can even be kept on a desktop for additional convenience. With high-definition toners, this printer prints to a high, professional standard allowing companies to bring more of their printing in house with the option to print everything from business cards to banners. The printer is a reliable, long-lasting machine which meets tough environmental standard with features such as automatic duplex printing and energy save modes. The small size does mean that standard paper capacity is low, but this can be increased with the purchase of additional trays. However, there is no fax, scan or copy function, which limits the use of the printer. Measuring just 242 x 410 x 504mm the Oki ES5430 comes in a compact, ergonomic design. Printing speeds are 26 ppm in colour and 30 ppm in monochrome. Paper capacity is 350 sheets in a 250 sheet paper tray and a 100 sheet multi-purpose tray. Capacity can be increased up to 880 sheets if required. A network interface allows multi-users. The versatile media handling of the Oki ES5430 allows it to print banners up to 1.2m. It has a number of environmental features such as duplex printing, high yield toners and energy saving modes, which will reduce costs as well as benefit the planet. High-definition toners result in vibrant, glossy colours. Oki’s print Supervision Software allows the printer to be remotely monitored. This printer is a compact, robust machine requiring little maintenance. Standard paper capacity on the Oki ES5430 is low, so the purchase of additional paper trays may need to be factored into the cost. With no fax, copy or scan function additional devices may be required.